The founding pastor of New Testament Baptist Church, Dr. A.C. Janney, came to Miami at the request of a group of people meeting in a Bible Study who wanted to start an independent, fundamental church. They held their first official service and organized the church on the first Sunday of March 1954, at NW 46th Street and 2nd Avenue.  The church felt the need to establish a Christian school, primarily because of prayer being removed from the public schools, and Dade Christian School was founded in 1961 as a ministry of the church. During the first year of operation there were 75 students in Grades 5K-6 that met in the church facilities. In 1964, the church purchased 100 acres in the Miami Lakes area, the current location, and in 1965 had the groundbreaking for a new facility. In August, 1966, Dade Christian moved to the new facility and has continued to grow in enrollment and expand its facilities. Dade Christian School is noted for its high academic achievement. Our students test above the state and national averages on achievement tests. Dade Christian is accredited by the Florida Association of Christian Colleges and Schools (FACCS), the Southern Association of Colleges and Schools (SACS), the National Council for Private School Accreditation (NCPSA), and the National Council for Private School Accreditation (NCPSA). All faculty members maintain certification through FACCS and all faculty in Kindergarten and above hold a minimum of a four-year college or university degree. Dade Christian was selected by the United States Department of Education as an exemplary school in 1985. Schools were selected for providing programs of excellence in education.